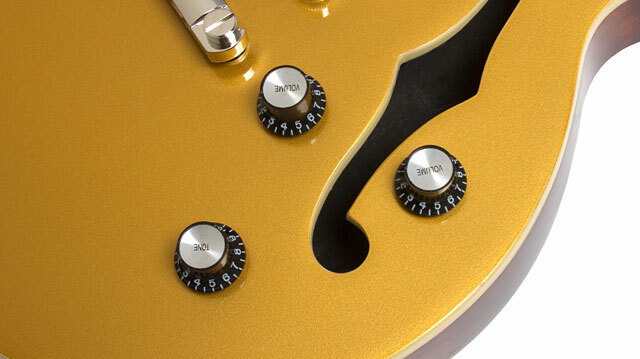 Available at select Epiphone retailers in exclusive colors with Dogear Classic P-90s! Epiphone presents the Ltd. Ed. Wildkat Studio, a no-frills version of the new generation archtop available only at select Epiphone retailers featuring Epiphone Dogear Classic P-90 pickups and in three exclusive color finishes, Antique Natural, Metallic Goldtop, and Wine Red. When the Epiphone Wildkat premiered in the early 90s, it introduced a new generation to historic Epiphone archtop style, which the “House of Stathopoulo” has been perfecting for nearly a century. Now the new Ltd. Ed. Wildkat Studio nouveau classic is back with new colors and a streamlined look. Like all Epiphones, the Ltd. Ed. Epiphone Wildkat Studio comes with the House of Stathopoulo’s limited lifetime guarantee and Gibson Brands’ world famous 365/24/7 Customer Support. The Ltd. Ed. Epiphone Wildkat Studio is only available at select Authorized Epiphone Dealers and for a limited time. Bring one home today while they last! Truss Rod Cover 2-Layer (Black/White) with "E"
The Epiphone Ltd. Ed. Wildkat Studio features the timeless Wildkat profile made from Mahogany with a Flame Maple top and classic Epiphone styled f-holes. The glued-in Hard Maple neck is hand-set and has a fast and comfortable 1960s SlimTaperTM D-profile with a 24.75” scale and a 12” radius. The neck has a beautiful fingerboard with pearloid ‘dot’ inlays and 22 medium jumbo frets. 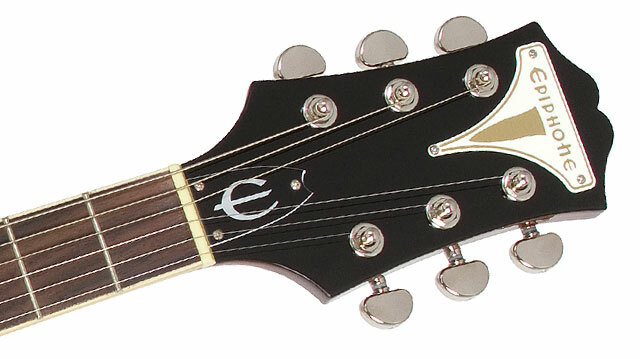 The truss rod cover (2-layer black & white) is matched to a classic 60s era “E” logo for Epiphone. The Sloped Dovewing headstock, also an iconic style from the early 60s, has a vintage Epiphone metal badge. The body has simple but elegant single-layer Ivory colored binding as does the top, fingerboard and f-holes. The Ltd. Ed. 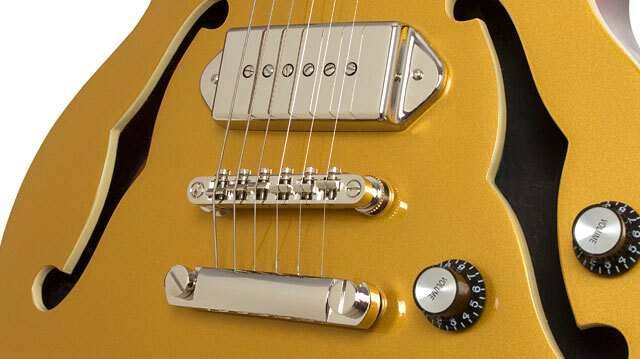 Wildkat Studio is powered by Epiphone designed “Dogear” Classic P-90 pickups, a favorite of Epi fans for decades. P-90 pickups are the world’s best single coil pickups made from Alnico magnets with precise articulation for leads and rock n’ roll growl for power chords and rhythm. Each pickup is activated via an Epiphone 3-way toggle switch for rhythm, lead, and a standard middle position for both pickups. Controls include a handy Master Volume, Master Tone, and individual volume controls for each pickup with Black “Top Hat” knobs with metal inserts. Epiphone hardware is just as famous as its electronics and the Ltd. Ed. Wildkat Studio comes with a time-tested Epiphone LockTone™ Tune-o-matic bridge and Epiphone Stopbar tailpiece combined with Epiphone Premium Die-Cast machine heads. Epiphone Die-Cast machine heads feature a pro-level 14:1 tuning ratio for precise intonation and rock solid tuning. Each Ltd. Ed. Wildkat Studio is set up at the Epiphone factory with the world’s finest strings from D'Addario® in a 10-46 (light) gauge. An Epiphone hard case is also available.